The Indian state government of Tamil Nadu this year presented a Gender Budget Statement as part of the annual budget documents, quantifying the allocations that will benefit women during this fiscal year. Finance Secretary K. Shanmugam said it is the first time such an exercise has been undertaken. Kamakshi Sundaramurthy, senior researcher of Social Watch Tamil Nadu, said the gender budget does not address the needs of sub-categories among women, such as those from among the minorities, Dalits and sub-castes. “These women need better education, healthcare and hostel facilities. Employment is also critical for their empowerment. They need the gender budget more than any of us but remain excluded,” Ms. Sundaramurthy said. 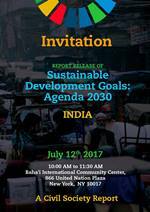 India: What does the 2030 Agenda mean to one-sixth of the world’s population? India is one of the world’s emerging economies, with impressive economic growth. While this growth has increased the income of a very small section of the population, India has the largest number of poor people in the world. The country has the world’s third largest number of billionaires and still millions of children are out of school; many millions of children do not live to the age of five; many millions of mothers die in childbirth. Despite economic growth, the country faces challenges of social and economic inequalities, urban-centred economic growth and shrinking civic spaces. While economic growth indeed made a difference to the large middle class, it is yet to ‘trickle down’ to rural poor, farmers and a vast number of poor and marginalized people, including Dalits (Scheduled Castes) and Adivasis (Scheduled Tribes), which make up 25 percent of the population. The environment is under increasing stress and there is a vibrant discussion about the consequences of mining and other disruptive activities on forests and environment and the implications for climate change. On the one hand, economic growth provides resources for greater investment in achieving the Sustainable Development Goals (SDGs), and on the other, the urban-centric growth model, and increasing instances of crony capitalism also result in rising inequality and shrinking democracy and civic spaces and pose a challenge to effectively realize the 2030 Agenda and its SDGs. The Citizens Report on Governance and Development 2013 is the seventh Citizens’ Report of National Social Watch. Democracy is not an easy system of governance. It is fragile and its essence cannot be guaranteed only because there is an assurance of periodic elections. Its fragility is dependent on several factors among whom is the way its governing institutions function and the kind of policies that are determined by them. This requires constant vigilance lest the people who come into power and institutions that they oversee function according to the mandate given to them by the people who have elected them go astray. This vigilance can be exercised only if there is information available to the people. Thus, transparency and availability of information is critical to hold then accountability. The National Social Watch Report and the Odisha Social Watch Report 2013 was launched on Tuesday 13th May 2014 in DRTC-CYSD, Bhubaneswar, India. Mr. Jagadananda, President of National Social Watch, presented both the reports, followed by the presentations of the findings of the reports and open discussions. Dowload the Citizens' Report on Governance and Development 2013 and Odisha Social Watch Report 2013. The National Social Watch Report on Governance and Development 2013, released today in Delhi, highlighted that 31% of MPs in Lok Sabha has pending criminal cases against them. The average salary package of each MP is 68 times higher than the percentage income in the country and total value of assets of 4 MPs is Rs. 29.2 billion. This report was released by Honorable Justice Ananga Patnaik, Supreme Court of India and Shri Satyanand Mishra former Chief Information Commissioner, Central Information Commission. Chief Guest Justice Ananga Patnaik said “this report gives an overview of our institutions”. He further added that giving only statistics would not work with parliamentarians and legislators. Give them suggestions as well. They may not accept them today and tomorrow they will be accepted. West Bengal Social Watch releases a Citizen’s Report on the performances of the 15TH West Bengal State Legislative Assembly till date. West Bengal Social Watch organized a ‘Discussion Meet on Current State of Affairs vis-à-vis Role of Citizens’ on November 30, 2013. Shri Chittotosh Mukherjee, former Chief Justice of Kolkata & Mumbai High Courts participated in the Press Conference hold on November 30, 2013. The citizens have therefore the right to know how their representatives are discharging their duties in the Assembly. The report is an attempt to provide some basic information about the West Bengal Legislative Assembly and, in particular, about the functioning of the present Assembly (15th Assembly), which was constituted in May 2011. Speaking at the UN General Assembly articulating the Indian civil society aspirations on actions to make the new development agenda work in developing nations that are home to 85 percent of the world's poor, Amitabh Behar representing National Social Watch (India) and Wada Na Todo Abhiyan emphasized that, “for the new development agenda to succeed, we need to move away from a poverty lens to a more holistic justice frame.” The new development frame will succeed the current Millennium Development Goals (MDGs) that expire in 2015. Mr. Amitabh Behar, a representative of a coalition of 4,000 Indian civil society organisations under the umbrella National Social Watch and Wada Na Todo Abhiyan, voiced the civil society concerns related to the new development agenda at the UN Special Event on MDGs at the 68th General Assembly in New York on September 25. Gujarat Social Watch has come up with study and analysis of the works of this Indian state Legislative Assembly-10th session of 12th assembly, as the elections are due in December this year. The book “Vidhantantra-Am Adami Ni Najare” is an effort to promote public engagement and improve accessibility and accountability to the members of this parliamentary body. Gujarat Social Watch (GSW, member of Social Watch India) revealed this week, in its review of the 10th session of the 12th Gujarati Legislative Assembly, that the chief minister (head of the state government) Narendra Modi spoke only three times in the entire session, which lasted 30 days. Central and local authorities’ failures are responsible for the gloomy performance of the health sector in Indian state of Chhattisgarh, according to the most recent report produced by the local Social Watch coalition. The governments must be held accountable for the fulfillment of this Constitutional and basic right, but the citizens also have the responsibility to monitor its implementation, activist said while they released the study. In India, where economic, social and gender inequalities persist historically, and where trade policies are not 'gender neutral' the impact of trade policy on women must be paid serious attention to. Ranja Sengupta, senior researcher with the Third World Network (TWN), is worried that as the country climbs up the ladder of an emerging economy, the health, education and food needs of women get affected. In an indication of elected representatives’ apathy to people’s causes, 129 of the 224 legislators in the Indian State of Karnataka have never posed a single question during the Legislature sessions held last year, revealed the Karnataka Social Watch Report 2012, according to The Hindu newspaper. Social Watch India organized two half-day workshops, the first on the Basic Capabilities Index (BCI) and the Gender Equity Index (GEI), and the second on National Minorities Commission. “The notion of evaluating social development on the basis of economical growth should change, as the studies from different aspects reveal the growing disparities in the societies across the globe,” said Dr.Yogesh Kumar, Executive Director of Samarthan and National Convener of Social Watch India. 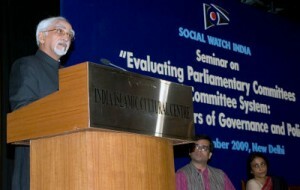 Kumar was talking in Bangalore at the launching of the Social Watch Report 2012. Do regional parliamentarians have a voice in Indian democracy? What is the role of parliamentary committees? What exactly is the ambit of a parliamentarian? Questions like these were debated at “People, Parliament and Performance”, a discussion conducted by Social Watch India in partnership with Governance Now magazine in New Delhi. The new figures set by the Indian government to define poverty (an income of USD 0.45 a day for urban people and one of 0.33 for those living in rural areas) are “abysmally low”, wrote Himanshu Jha, the national coordinator of Social Watch India, in his most recent column for The New Indian Express, one of the major newspapers of his country. The politics fixed according to these indicators can exclude “a large section of the population” that needs aid from “the available social security net, which in this country is minimalist by any standard,” he warned. The 2010 report of Social Watch India, to be launched in Delhi next Tuesday December 21st, includes evaluation of the working of Parliament in terms of the issues of representation and accountability, and examines the role and consequences of the Union’s public policy and its effects on the lives of the people. In addition, issues of judiciary - confrontation with the executive, pendency of cases, probity of judges and persisting vacancies at all levels- are qualitatively and quantitatively analysed. The dynamics of International Financial Institutions and private capital in the globalized world has often acted as delimiting factors to state sovereignty. The role of Social Watch as a ‘watch dog’ gains significance in the current context of multiple crisis stressed the Pan-Asian Workshop: "Who pays? The global crises and what needs to be done – an Asian perspective" held in New Delhi, India, 22- 24 February 2010. NEW DELHI: In a scathing indictment of the parliamentary committee system, an independent report has said that leave alone acting as watchdogs, committees were vulnerable to manipulation. The report — Evaluating Parliamentary Committees and Committee System — prepared by the National Social Watch Coalition elaborates with examples how committees have been used by the government to serve its ends. Next month in India, the “world´s largest democracy” will begin a process of national Parliamentary elections for the first time since 2004, in a critical moment in which issues related to security and to the economy are weighing heavily on voters´ minds. Taking this context into account, this month´s “Spotlight On…” column will focus on the Social Watch India coalition, whose work to promote transparency and accountability in politics will be crucial during this election period. Social Watch India released the first perspective paper on “Law Under Globalization” which provides an insight into recent trends in both law making processes and judicial behaviour, with a stress on how the logic and instruments of globalization are directly affecting the rule of law. A civil society delegation representing the National Social Watch Coalition (NSWC) engaged in a meaningful interaction with the Planning Commission around the Citizens' Report on Governance and Development 2007 and the monitoring of the key institutions of governance namely Parliament, Executive- Policy, Judiciary and Local self Governance. Deputy Chairperson of the Planning Commission Mr. Montek Singh Ahluwalia and the Planning Commission Members actively participated in the discourse. The Social Watch India Report 2007 will be released on 30th June 2007 at Stein Auditorium, India Habitat Centre, New Delhi . The report focuses on the performance of institutions of governance namely the Parliament, the Executive, the Judiciary and the institutions of local self governance from a human rights perspective. The Social Watch India Report 2007 emphasizes the importance of ensuring these Rights to vulnerable sections such as the tribals, the dalits, the poor and the women. Andhra Pradesh Social Watch Coalition & Dalit Bahujan Shramik Union invite to the Release of A.P. Social Watch Report 2007 that will be held next Tuesday 22nd May 2007, Indira Park, Hyderabad. The National Social Watch coalition launched the "First Citizens Report on Governance and Development" on June 9, 2003, in New Delhi, India.